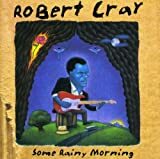 Robert William Cray (born August 1, 1953) is an American blues guitarist and singer. He has led his own band and won five Grammy Awards. One music journalist noted "If you define 'blues' by the rigid categories of structure rather than the flexible language of feeling allusion, Robert Cray... Larry Garner, Joe Louis Walker and James Armstrong are a new and uncategorizable breed, their music blues-like rather than blues, each of them blending ideas and devices from a variety of sources – soul, rock, jazz, gospel – with a sophistication beyond the reach of their forerunners".